To qualify for the hosted buyers program the applicants must be importers, wholesalers, distributors, chain store or Super Market representatives, field specialists, Heads of Body/Organization/Association. In the case of Philoxenia Exhibition, applicants must be agency representatives, tour operators / travel agents, association or corporate buyers who are responsible for planning, organizing, recommending or making financial decisions for events outside their home country. The approval of any hosted buyer belonging to professional sectors/categories not included in the above is subject to the Organizer’s final decision. The hosted buyers of all exhibitions must have purchase authority and be final decision makers for this matter. Furthermore they have to commit to attending at least fifteen individual appointments during their visit at the Exhibition with exhibitors of their choice, while accepting additional appointments that may be arranged for them either by the competent Hosted Buyers Team or requested by the exhibitors themselves. 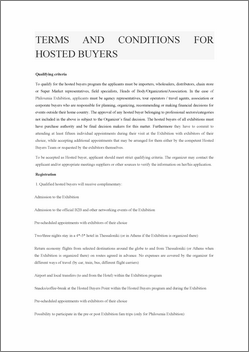 To be accepted as Hosted buyer, applicant should meet strict qualifying criteria. The organizer may contact the applicant and/or appropriate meetings suppliers or other sources to verify the information on her/his application. All other costs and incidental expenses are the responsibility of each attendee, examples include private transfers, flight upgrades, hotel upgrades, additional nights’ accommodation, personal extras, travel insurance, etc. Completion of the application form does not automatically guarantee you a place in the hosted buyers program. You will be notified in writing if your application is successful. TIF-HELEXPO reserves the right to decline your registration without reason. Organizer’s decision is final. The Organizer will only accept one application per participant. If more than one application per participant is received, only the first application will be accepted. All required sections of the application form must be fully completed. Failure to do so will result in the form not being processed. Should cancellation and ‘no show’ charges apply they will be debited from the credit card details of which must have been supplied by the applicant before the actual confirmation of his/her participation by the Organizer (credit card details must be written on the hosted buyer’s application form and a copy of both sides of the credit card must be sent to the Organizer via e-mail together with a copy of the hosted buyer’s passport immediately after confirmation of the hosted buyer status has been sent by the Organizer and before the air ticket is issued) . Participants who are not accepted for the hosted buyer program will have the opportunity to attend the exhibition as invited buyers, on their own expenses and may apply again in a future event. By accepting the hosted buyer status, all hosted buyers are consenting to their contact details being made available to all exhibitors as well as all official show partners, sponsors. The Organizer is responsible for coordinating your participation as a hosted buyer at the Exhibition including accommodation, transfers and appointment setting. Flights will be booked by the Organizer over the period of the Exhibition only. All attendance queries should be directed to the Organizer. Hosted buyers are not to contact the TIF-HELEXPO travel suppliers (i.e., agents, airlines and hotels) directly, unless advised to do so. The hosted buyer who wishes to make his/her own travel arrangements must inform the Organizer directly and ensure that travel is according to his/her chosen days of attendance and at times which allow him/her to complete his/her full obligation of appointments. In that case all expenses related to the Hosted Buyer’s air ticket shall be on his/her own expenses. The hosted buyer must make sure that his/her visit is organized within the dates set by the Organizer for the B2B appointments (usually during the first two days of the Exhibition). These dates have to be agreed between the Hosted buyer and the Organizer. In this case, the hosted buyer may enjoy all hosted buyers privileges including accommodation, except for the air ticket expenses. TIF-HELEXPO takes no responsibility for any hosted buyer who may miss organized flights, transfers or functions related to the Exhibition. This includes buyers missing flights due to visa complications, airline delays and cancellations. Any additional expense incurred is at the buyer’s own expense. Hosted buyers who are accepted by the Organizer commit to attend a minimum of fifteen one-to-one appointments during their visit to the Exhibition. One-to-one meetings have to be arranged in advance via an on-line appointment system. Hosted buyers who do not conclude appointments by the agreed date will be liable for the ‘no show’ fee. Hosted buyers who are unable to honor an appointment should contact the exhibitor directly to arrange a more convenient appointment time. Only one person per company can be accepted as a hosted buyer. Further persons may attend the Exhibition as invited guests (they cover their own travel and accommodation but have complementary access to the Exhibition including all services granted to hosted buyers at the Exhibition). Exceptions can be made for large companies or if otherwise agreed with the Organizer. If one or more persons from the same organization attend the Exhibition as hosted buyers then those persons must conduct their appointments individually. Please note that attendance at appointments will be monitored and non attendance shall constitute a breach of these Terms and conditions. The Organizer will give on-site instructions on attendance verification. If you need to cancel your participation at the Exhibition, you must inform the Organizer in writing. The cancellation will not be effective until you have received a written acknowledgement from the Organizer. Cancellations received latest one month before the opening date of the Exhibition do not incur a fee, unless the flight has been agreed and confirmed and hotel cancellation fees are charged. If the flight has been confirmed the cost of the flight, hotel cancellation fees and/or any other fees and expenses incurred will be charged. Charges will be debited from the credit card detailed on your application. ‘No show’ is defined as a hosted buyer who without giving prior written notice of cancellation does not complete appointment requirements and/or is not present for the hosted buyer activities at the Exhibition. Hosted buyers’ participation and attendance are monitored by the Organizer and exhibitors. In the event of a breach of no show Terms and conditions, TIF-HELEXPO reserves the right to cancel your hosted buyer status and charge you the ‘no show’ fee. The ‘no show’ fee is 500 EUR (unless the cost of the issued air ticket, hotel cancellation and other costs, fees and charges exceed this amount, in which case the real amount shall be charged on the hosted buyer’s credit card by the Organizer). All cancellation and no show charges will be debited by TIF-HELEXPO to the credit card detailed in your application. All cancellation charges and no show fees are inclusive of VAT or equivalent tax. An invoice receipt detailing the charges will be sent to you. Cancellation of attendance fees, no show fees, flight/hotel cancellation fees and other costs/charges shall be payable by the hosted buyer within 14 days of the closing date of the Exhibition. The Organizer shall take payment of such cancellation and no show fees from the hosted buyer’s credit card (details of which must be provided by the hosted buyer on registration) 14 days after the closing date of the Exhibition, if the payment has not been made by other means. The Organizer will provide the hosted buyer with a receipt in respect of such credit card charges for cancellation of attendance fees, no show fees and flight/hotel cancellation fees. Your acceptance to the hosted buyer program is non-transferable. Should a circumstance arise whereby you have to cancel your participation, you may request to substitute another person from your organization. The Organizer may choose to accept that substitute person after reviewing his/her fully completed application form. If the substitute meets the qualification criteria and if the substitution is made early enough, namely twenty (20) days prior to the Exhibition, then cancellation charges will not apply to the original buyer unless the flight has been confirmed. If the flight has been confirmed, the cost of the flight will be charged. If the substitution is made after the air ticket has been issued and the hotel has been charged, cancellation charges will apply unless agreed otherwise with the Organizer. If the substitution is not accepted by the Organizer, then the usual cancellation and no show terms shall apply to the original hosted buyer. Travel will be arranged on dates suitable for attendance at the Exhibition. Due to airline restrictions, changes to confirmed travel plans or travel change requests received later than 30 days prior to the opening of the Exhibition will be considered by the Organizer on a case by case basis. The Organizer reserves the right to make charges for travel changes. Charges will be notified to you and will be debited from the credit card detailed in your application. Any unused flight tickets must be returned directly to the Organizer. Please note that participants from certain countries may require a visa to enter Greece / the European Union. It is the responsibility of each participant to contact the Organizer for a visa application letter and to organize their own individual visa. Buyers who are unable to travel because of failure to obtain a valid visa will be subject to the standard cancellation or no show charges. Please note that travel insurance is the responsibility of each individual hosted buyer. The Organizer will not supply travel insurance for hosted buyers. Travel insurance must be in effect from the day of departure up to and including the day you arrive back to your home country. Hosted buyers are responsible for the payment of excess baggage, customs fines etc. TIF-HELEXPO does not endorse or approve export gifts or samples given to hosted buyers by exhibitors. It is the responsibility of each attendee to ensure that such gifts may be legally removed from Greece and imported into your home country. Hosted buyers must settle all expenses with the hotel prior to departure and will indemnify the Organizer for any failure to do so. Familiarization trips are organized by the host destination. Hosted buyers are accepted by the host destination on the basis that they meet the criteria determined by the host destination. Transfers are coordinated by the Organizer and the host destination. Accommodation is the sole responsibility of the host destination for the duration of the trip. After a maximum number of hosted buyers per fam trip is reached (this number is set by the host destination) the participation at such fam trip will not be possible. Attendance at a fam trip is subject to arriving/departing flights availability. If you need to cancel your participation in a fam trip, then you must inform the Organizer. Your cancellation must be acknowledged in writing by the Organizer for it to be effective. Cancellations received latest 30 days prior to the opening of Philoxenia Exhibition do not incur a fee, unless the flight has been agreed and confirmed and hotel cancellation fees incur. If the flight has been confirmed and hotel cancellation fees incur the cost of the flight and the hotel cancellation fees will be charged. Cancellations within the last 30 days before the opening of Philoxenia exhibition may incur an additional fee from the host destination to cover costs incurred by them for transfers and accommodation relating to the fam trip up to the date of cancellation and this additional fee will be charged. Costs regarding revised flights may also be incurred and will be payable to the Organizer for the change in the Hosted Buyers return ticket. Cancellation fees, flight/hotel cancellation fees and other costs/charges aforementioned, shall be payable by the hosted buyer within 14 days of the closing date of Philoxenia exhibition. The Organizer shall take payment of such cancellation fees from the hosted buyer’s credit card (details of which must be provided by the hosted buyer on registration) 14 days after the closing date of the Philoxenia Exhibition, if the payment has not been made by other means. The Organizer will provide the hosted buyer with a receipt in respect of such credit card charges. All matters and questions not covered by these Terms and Conditions are subject to the decision of the Organizers. Foregoing Terms and Conditions may be amended or added by the Organizers at their discretion. The Hosted buyer agrees to abide by any and all amendments and changes by the Organizers as well as rules and regulations set out in the present Hosted buyers Terms and Conditions. The Organizer and the Hosted buyer will settle all eventual disputes in an amicable way. 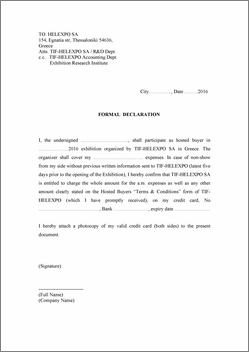 In case a dispute cannot be settled in this way, the Organizer and Hosted buyer agree that the Courts of Thessaloniki, Greece are competent to settle any such dispute, according to Greek Law.